Sunday was patient moving day at the new, $415 million UF Health Heart & Vascular and Neuromedicine hospitals, a complicated ballet involving about 1,000 health care workers and volunteers, 139 patients and a command center about as busy as NASA’s during a rocket launch. 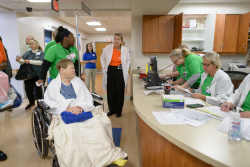 Using rolling stretchers, wheelchairs or beds, three- to five-person teams transported about 24 patients per hour through a warren of hallways and tunnels from other UF Health hospitals to their new rooms across the street. Most of the patients came from UF Health Shands Hospital. Some employees were stationed along the way, directing wheelchairs and stretchers like traffic cops. The two new hospitals, already fully stocked with supplies and staff, awaited them. The tunnels took patients under Archer Road, which meant nobody had to go outside and brave temperatures that, when work began at 7 a.m., hovered in the low- to mid-30s. It took a little more than six hours to complete the move. And just like that, the two new hospitals are open and operating on all cylinders after about five years of study, planning, design and construction. “Our physicians, nurses and staff have been preparing for this move for a long time, and we are all excited to finally have the new hospitals open to welcome patients,” said David S. Guzick, M.D., Ph.D., senior vice president for health affairs at UF and president of UF Health. The new hospitals, designed with the patient in mind, will help UF Health teams provide the best possible health care, and provide a healing place for patients and families. “UF Health has become a destination for patients seeking care for heart, vascular and neuromedicine conditions, and now our dedicated staff can care for them in these two new specialized hospitals,” said Ed Jimenez, CEO of UF Health Shands. Aside from the 139 patients moved into the new hospitals, staff also transported an additional 30 between rooms at UF Health Shands as the hospital begins refurbishing the emptied space. The move was seamless for patients, in part because “packing” teams and “unpacking” teams assisted them at both hospitals. Many of the patients said it was a welcome interlude from their hospital routine. Count among them Bobbie Thornton, 32, of Wauchula, who — after being hospitalized for 25 days awaiting a heart transplant — was overjoyed to get a change of scenery. Thornton, who has a congenital heart disease, was accompanied on the journey by her parents, Judy and Carl Thornton, niece Gairyn, 9, and nephew Gatlin, 12. Thornton said the nicest part of everything was seeing her new room’s bigger windows with a view that stretched to Paynes Prairie. Kim Stone, 55, of Crystal River, who had suffered a minor stroke earlier in the week, said she thought the view would help her heal. But what she really liked was that all 216 rooms in the two hospitals are private. Stone had a roommate across the street. As patients arrived at their rooms, they were quickly greeted with either breakfast or lunch. Lee Marlowe, assistant director of clinical nutrition, proudly noted that the move did not derail meal service one bit. Everybody, she said, got their food on time. All of the patients received a complimentary UF Health blanket they can keep when they return home. UF Health employees presented one patient, Jerry Foley, 43, of Auburndale, with a big, overstuffed bear, which then gave his procession to the new hospitals the flavor of a Winnie the Pooh parade. Foley, who had been hospitalized three weeks, has a congenital heart defect and now awaits a heart and liver transplant. It took about 20 minutes for the trip over to his new room. "Going from the old to the new is pretty neat,” Foley said as he was wheeled over. As he rode down an elevator in UF Health Shands Hospital, someone on his transport team joked with Foley after noticing a Florida State University Christmas ornament hanging from his IV stand. This is, after all, Gator country.